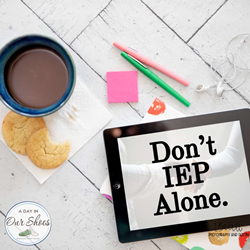 Lisa’s newly published podcast, Don’t IEP Alone, is the only podcast of its kind, dedicated to helping parents navigate the IEP process. Some of the topics include: How to write your best parent concerns letter for your IEP; The one thing you need to be doing for your IEP; What parents should know about ESY and more. Listeners can hear all ten current episodes now and subscribe to be notified when new episodes are available. Inspired by her son with disabilities, Lisa Lightner is an award-winning blogger and advocate. She has previously worked for her county's Arc and has served on the Boards of Directors for several disability organizations. Currently, she is her county's chairperson for the Right to Education Task Force, a federally decreed group set up in 1971 to ensure that all children in Pennsylvania had the opportunity to an education. When not attending IEP meetings with families or lobbying in Harrisburg and DC for disability rights, she can be found on the web at her IEP advice blog, A Day in our Shoes, where she shares information, and resources that help parents make more informed decisions regarding their child with disabilities and their IEP meetings, how to communicate with schools and teachers, and other common questions. She is known for her practical, realistic and implementable advice for parents. Lisa’s education advocacy work includes coordinating fundraising events, monthly speaking engagements, serving on school district committees and the board of directors for a special education/disability non-profit. As an education advocate, Lisa consults with parents who need help understanding and navigating the IEP process. While every child and their situation are different, Lisa provides answers to very common questions or issues that are seen by parents navigating the IEP process. As a part of Lisa’s ongoing advocacy work, she has released this IEP bundle for parents of children with disabilities, available now on her website. This new bundle includes a 2019 IEP organizer, vision statement/future planning workbook, IEP meeting prep checklist, IEP goal tracking worksheet, a booklet of IEP accommodations and strategies, webinar on understanding the PWN, and more. The downloadable organizer can be reused each year and allows parents to easily and efficiently track and compare their child’s data from year to year. Lisa’s website has been featured, nominated, and mentioned dozens of times by various stations and foundations. She writes and contributes to multiple websites and magazines and has appeared on television and radio shows as well as received accolades from several magazines. To learn more about Lisa, join her at The Brain Recovery Project: Childhood Epilepsy Surgery Foundation Family Conference July 18th-20 in Cleveland, Ohio. To reach Lisa for speaking engagements, consulting work, or other potential professional opportunities, please email her at lisa(at)adayinourshoes.com. Lisa received a Bachelor of Science from Lock Haven University. She has served as a board member numerous disability organizations and 503©3s. She was named Arc Advocate of the Year in 2012 and is a current blogger and ambassador for multiple organizations.